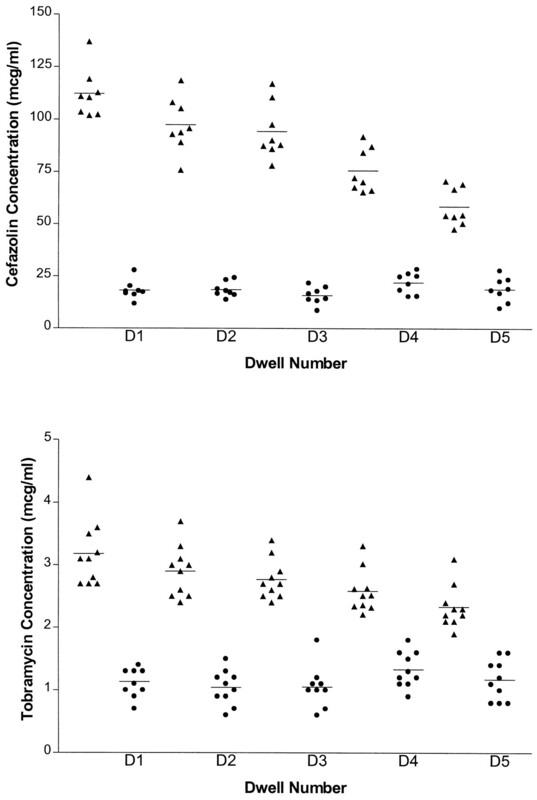 Mean cefazolin and tobramycin serum and dialysate concentrations at end of dwell. •, dialysate concentration ; ▴, serum concentration. aESRD, end-stage renal disease ; Dx, diagnosis ; PD, peritoneal dialysis ; ABW, actual body weight ; IBW, ideal body weight ; BSA, body surface area ; DM, diabetes mellitus ; GN, glomerulonephritis ; PKD, polycystic kidney disease ; X, no drug given. akel, serum elimination rate ; t1/2, half-life ; ksd, serum to dialysate transfer rate ; Vd, volume of distribution.